Update, 3:40 PST: Aaaaand of course there's already a Change.org petition to try and get Valve to reconsider paid mods. It's already received nearly 4,000 signatures which is pretty impressive, though Valve of course has no obligation to pay any attention. I expect this experiment to continue for a while, regardless of any animosity by the community. Draw up a list of the Top 5 Reasons to be a PC Gamer and you’d better make sure mod support is at the top. The ability for the PC community to come together and fix games that are broken, extend the lifespan of old games, or even convert games to entirely new purposes is the best reason to stay away from consoles. Just last week I replayed Max Payne (released in 2001) and used both a community patch that fixes some audio glitches and a mod to play in widescreen. Amazing. But perhaps the most amazing thing about game mods is they’re done for free. It’s always been that way, traditionally. Developers pour hours—sometimes hundreds of hours—of time into a project for…whatever reason. Sometimes to generate portfolio pieces. Sometimes for notoriety in the community. Sometimes just for love of the game. Well that changes today, maybe. 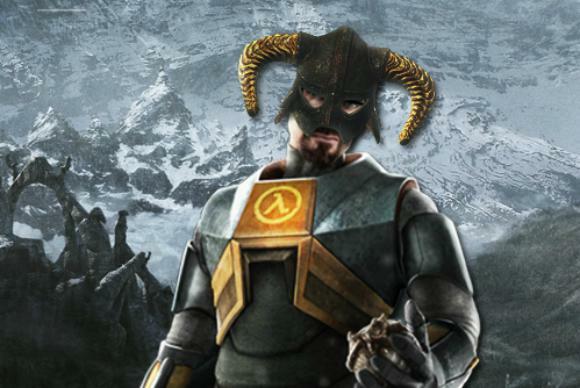 Starting with The Elder Scrolls V: Skyrim, a.k.a. one of the most modded games of all time, Valve is allowing developers to charge for mods delivered through Steam Workshop. I say things will “maybe” change because as you can imagine, the community is strongly divided right now. "We think this is a great opportunity to help support the incredible creative work being done by mod makers in the Steam Workshop. 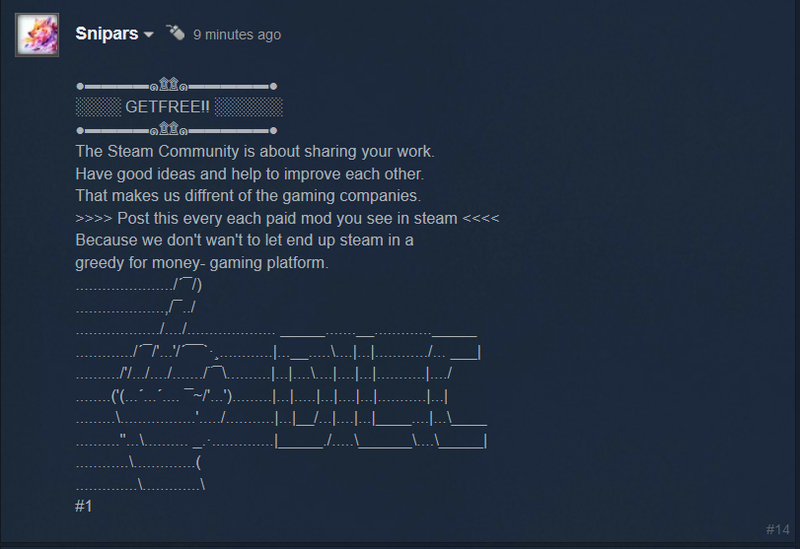 User generated content is an increasingly significant component of many games, and opening new avenues to help financially support those contributors via Steam Workshop will help drive the level of UGC to new heights." And that’s just from three threads. It took me less than five minutes to find that much anger. And there’s way more where that came from. A few members of the community are happy with the new development, but overall I’d say it’s at least 75 percent negative. So the question is “What happens next?” Does the community start pirating mods? Do other mod developers come in and duplicate work that’s been put behind a paywall, throw a donation button up, and reap the rewards of people’s current anger? Or does the experiment outlive the anger and we’re soon accustomed to paying for mods? It’s a hard call either way. On the one hand, I want to see developers get paid—and even better if some of the best and most widespread mods (like the DarthMod series for Total War) could sustain creators. On the other hand…it’s always been free. And that’s part of what made it so attractive. People have fixed or worked on the most random of games and glitches, just from love of the source material. And when certain mods don’t work, you just uninstall them and move on. You don’t get mad. You don’t feel burned. Charging for mods now brings a whole new level of developer accountability into the equation that was unnecessary before. What happens when a developer scams people? Or under-delivers on promises? Who’s responsible? Valve says you can receive a refund within 24 hours of purchasing a mod, but that's still not a fantastic policy for consumers. I’m not ready to sound the death knell on mods yet. If there’s one thing I’ve learned about PC gaming, it’s that it’s incredibly resilient. When damage occurs—whether DRM or servers being taken offline or a broken port or what have you—the community will rally and route around it. We’ll just have to wait and see whether over time the community sees Valve’s little experiment here as “damage” or something to embrace. Primary art courtesy of this now-paid mod Lambda Locator on the Steam Workshop.